Dec 14, 2017 @ 10:00 AM — by Retina Associates, P.A. At Retina Associates, P.A., our eye doctors specialize in treating eye conditions that affect the retina. Retinal conditions compromise the light-sensitive tissues of the retina and make it more difficult for the brain to process a clear, crisp image. To understand how retinal conditions and other eye diseases affect vision, it is important to have some basic knowledge about the anatomy of the eye. Our Kansas City, MO ophthalmologists are happy to give our patients a clearer understanding of how the eye works and the important role that each part of the eye plays in providing clear vision. Here are some brief descriptions of the main components of the eye, and how each one contributes to eyesight. The cornea is the clear, outer most layer of the eye. The cornea focuses light that enters the eye so that a clear visual image can be created. Abnormalities of the cornea are primarily responsible for the most basic forms of vision impairment, include nearsightedness, farsightedness, as astigmatism. Vision impairment that is caused by corneal imperfections can be corrected through the use of prescription lenses, such as glasses or contact lenses. Alternatively, laser vision treatment, such as LASIK, can reshape the cornea to provide long-term vision correction. The iris is the colored part of the eye that sits behind the cornea. The iris does much more than dictate what color eyes a person will have. The iris works along with the pupil (the small, circular opening in the center of the cornea) to control how much light enters the eye. If too little light enters the eye or too much light enters the eye, it will be more difficult to see. If there is too much light, the iris will shrink the size of the pupil. In situations where light is lacking, the iris will increase the size of the pupil. Many people confuse the lens with the cornea and mistakenly believe that the lens is the top layer of the eye. The lens actually sits behind the iris and pupil. The lens helps further focus light that enters the eye. 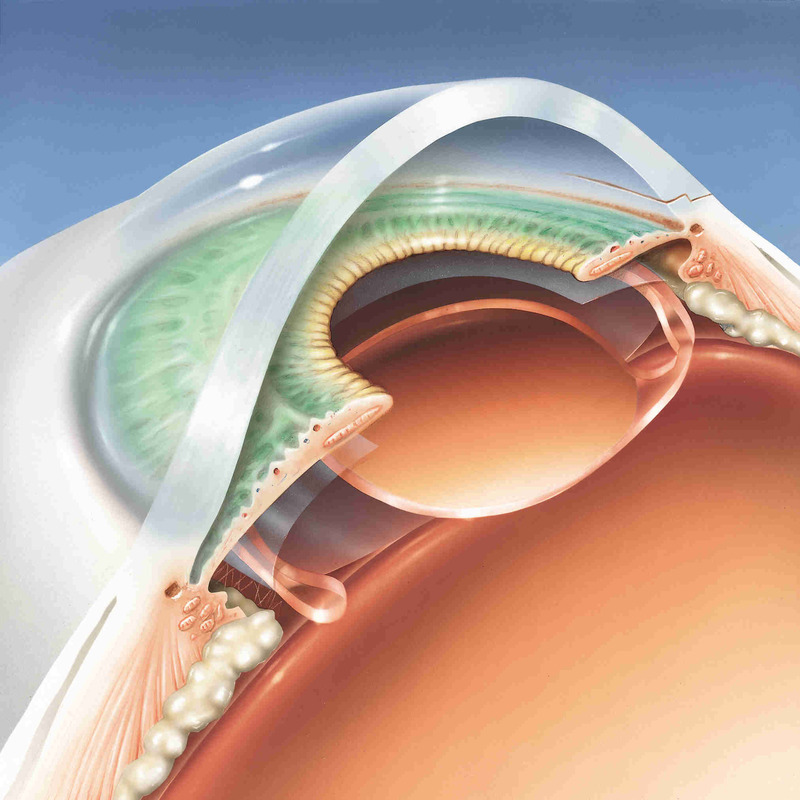 Cataracts are the most common condition to affect the lens of the eye. A cataract is a crystalized collection of proteins that clouds the lens of the eye and compromises vision. In the early stages of the condition, cataracts can be controlled through the use of prescription lenses, but eventually, cataract surgery will be necessary to replace the natural lens of the eye with an artificial lens, or IOL. The retina is a collection of light-sensitive tissues and optic nerves that line the back of the eye. Light enters the retina and is converted into electric signals that are sent to the brain, where an image is created. The center part of the retina is called the macula. There are a number of conditions that can affect the retina or macula, and compromise a person’s central vision. Our doctors specialize in diagnosing and treating these conditions so that our patients can benefit from the clear central vision that allows them to read, drive, and see fine details. If you have noticed any changes in your vision, it is important to see an experienced eye doctor as soon as possible so that any possible conditions can be diagnosed and treated. To learn more about the comprehensive range of services and treatments available at Retina Associates, P.A., contact us at your earliest convenience.